Google Lat Long: 3 course dinners? 3 easy steps to let your customers know. 3 course dinners? 3 easy steps to let your customers know. , when restaurants across a city host prix fixe menus, are starting in various parts of the world so we wanted to share a few tips whether you're looking for restaurants or you manage a restaurant. For interested diners, finding the top restaurants has never been easier. We have continually updated our business pages with more reviews, feature ratings to measure aspects of the restaurant that might interest you, and even the ability to see updates from the owner. We've recently partnered with the San Francisco Convention & Visitors Bureau, to help drive new patrons to Dine About Town's participating restaurants. 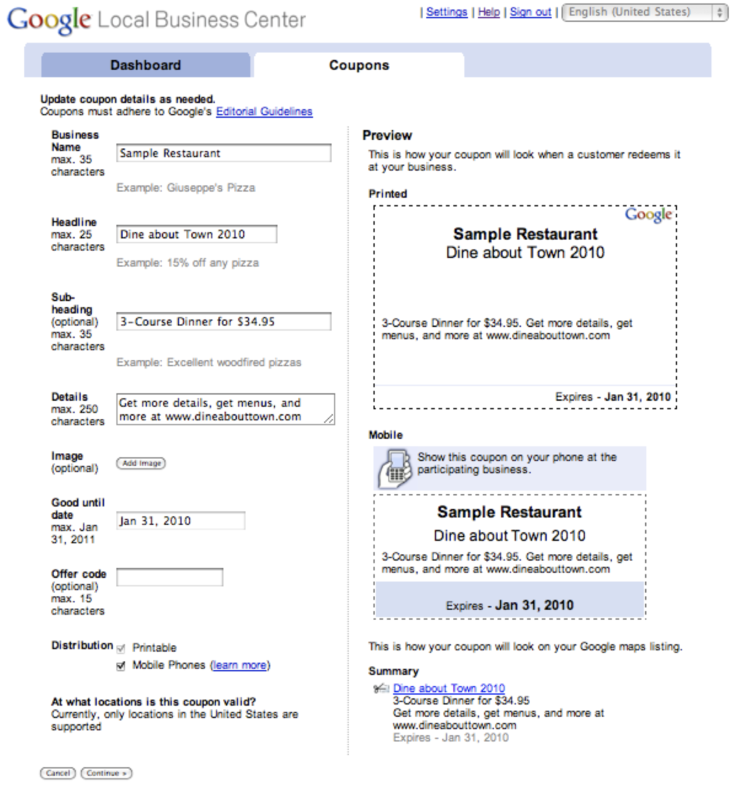 Since many of their potential customers begin their search on Google, we wanted to share some simple steps for them to enhance their exposure on Google as a participating restaurant - and we hope these will help any other interested restaurateurs. First, if you haven't already signed up for Google's Local Business Center, it's a free service that allows you to add menus, photos, and videos to your Google local business listing while making sure basic address & contact information is correct on the search engine. Third, use the new updates feature in Local Business Center to post real-time messages about your participation in your local restaurant week, including menu items, specials of the day and more. Learn more here. Why is this important? 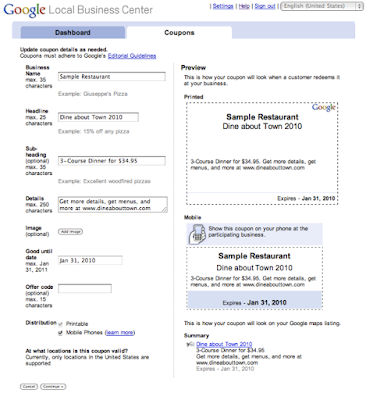 If a potential customer is searching on Google for a type of restaurant that matches your restaurant description, your listing will be up-to-date with news that you are participating in Dine About Town or any other events you are participating in. Afterwards, a personalized report allows you to see how often your listing was found on Google, and how people got there. For more information or to answer questions, please go here. We hope restaurant weeks go well all over the country and happy dining. If you are involved in a resturant week and would like to see how we can partner up, click on this form and we can contact you. Restaurant weeks, when restaurants across a city host prix fixe menus, are starting in various parts of the world so we wanted to share a few tips whether you're looking for restaurants or you manage a restaurant.